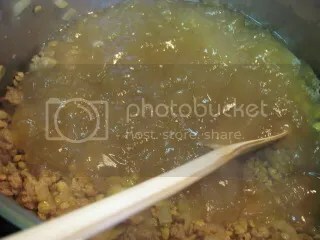 Posted by Toy Lady in Cooking, random stuff, soupe du semaine. Artificial ingredients, fake food, it’s all just wrong. That goes equally for faux-cheese and for “fill-in-the-blank” style sausage. If you’re going to eat sausage, eat sausage. If you want soy, have soy. Don’t try to pretend “soy cheese” is actually food. Don’t get me wrong. We eat our share of meatless meals – or we try to, anyway. But we like our meatless meals to be proudly meatless. None of this “oh, I don’t eat meat, so I’m going to chop and form a BEAN and pretend it’s bacon.” I want lentils that KNOW they’re lentils, darn it! Beans in all their beany glory! Vegetables that are in your FACE vegetables! Unfortunately, I often check my email at work while my (homemade, real-food) lunch is heating up, or, in other words, I read recipe newsletters when I’m hungry. 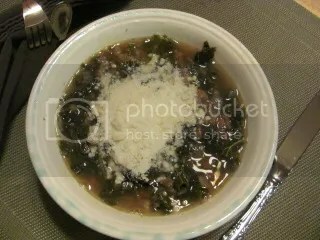 That means, basically, that pretty much everything sounds good to me – even lentil soup with industrial kale and faux sausage – and pretend parmesan as a garnish! But you know, we can always use our our real, homemade chorizo sausage – we don’t need to use that “chorizo-style” soy stuff. Chorizo-style? Just what’s on that ingredient list, I can’t help but wonder? Chorizo sausage is really not that hard to make yourself. And so, while about half a pound of REAL sausage was cooking, along with a chopped onion and some garlic for good measure, I went out to the garden for some fresh kale. After all, if you can get fresh, why not, right? 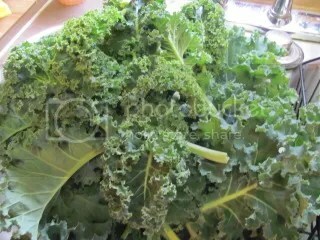 I used a small kale bush – I’m saving the big ones for my mother. The leaves weighed about 10 ounces or so, and I cut the tough ribs out and chopped it. It’s soup, so I’m not going to get too worked up about exact measurements. 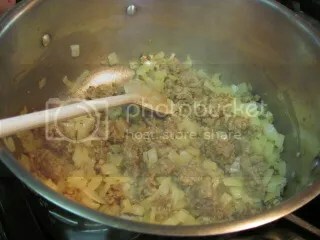 Once the sausage and onions were browned, I added a cup of brown lentils, then in went some chicken stock. Obviously it was homemade – you can tell because it was the consistency of Jell-o. (By the way, do you know that Jello is a local, Rochester-area product? We have much to be proud of in this area!) I could have used vegetable broth, but I went with chicken. Probably a good call. 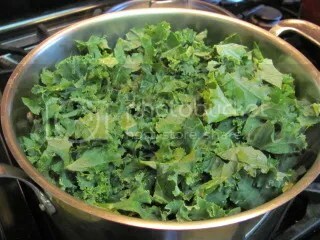 Once the stock came up to a simmer, and the sausage and onions were cooked, it was time to add the chopped kale. Could you use collard greens? Sure. Spinach? Probably, though I would probably make sure the sausage and lentils were completely cooked, first – spinach cooks a lot faster than the heartier greens. But it would work just fine, to be sure. And once the greens cooked down enough that I could actually see the broth, it was time to taste. You may notice that there was no added salt in this recipe. Now I’m sure that has something to do with the fact that the original recipe used a lot of processed ingredients – canned lentils and broth and (shudder) soy chorizo. My stuff doesn’t have a lot of added salt, and the broth needed it. Some pepper too. 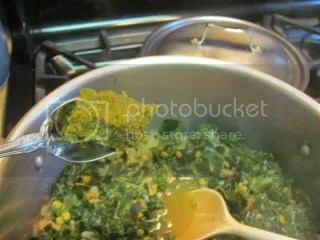 Perhaps as a nod to the “vegetarian” nature of the recipe, I used my veggie bouillon – a little dab’ll do ya! That stuff is handy to have around! 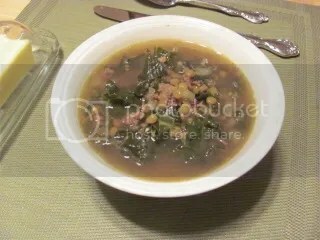 We let the soup simmer a bit longer, until the lentils were soft and the kale was tender. And since we like to do our soups ahead of time – after all, a couple of days in the fridge does nothing but good for a soup! – we put it away until serving time. Then we just plopped the dumped the whole mess into the slow-cooker and let it reheat slowly. All in all, it was a perfectly good soup – and one that will lend itself to nearly endless variations. And when we added some actual, non-soy cheese, it was even better! 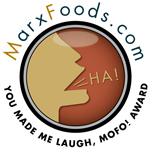 Having tried soy cheese on my one venture to a vegan restaurant, I am convinced it is a creation of Satan. Nasty! I had to use some one time – it was a meat dish and the lady kept kosher, so we couldn’t use real cheese. I’ve been vegetarian for several years. One thing I do not do, is try to replace the meat in a meal. There are loads of good things to eat, without Chik*n strips or Morningstar ‘burger’ crumbles. I do admit to the (very) occasional veggie burger, but you won’t find meat substitutes in my house. Rice, grains, beans (beans and more beans! ), real cheese, and of course, a few token veggies. 😀 It did take a while to learn to cook this way, but we haven’t starved yet! I know it was DELICIOUS. With some for lunch tomorrow.